Math Matters is a series of stories with real-life math connections. Each engaging book offers real-kid characters who confront humorous dilemmas and come up with clever solutions. 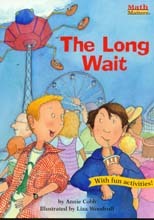 Josh and Zack can't wait to ride the Cosmic Beetle at the amusement park, but there's a very long line and they try to figure out how long, and how long must they wait?